What is Eurocentrism? What is an Athens-to-Washington discourse of world history? And how does the continent of Africa fit into this worldview? 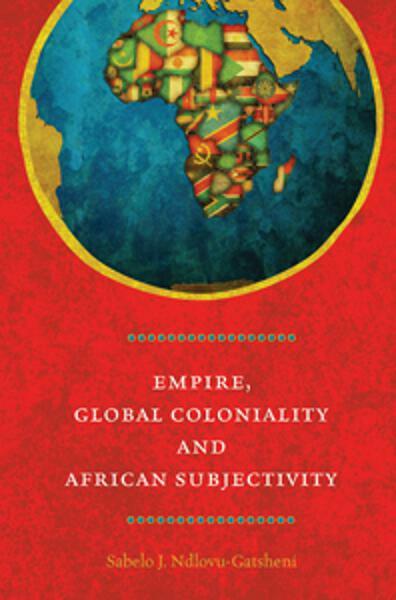 Empire, Global Coloniality and African Subjectivity came about as a way for us to find answers to these questions and light Africa’s situation within the ‘zone of non-being.’ Below, Dr. Sabelo J. Ndlovu-Gatsheni explains the research and motivation behind the book. I am interested in understanding how the world works. My research into modernity, empire, colonialism, coloniality and African subjectivity is an attempt to understand how the world system and its international orders have been politically constituted. As an African scholar, my preoccupation has been to understand particularly the idea and invention of Africa and why its history has been imprisoned in the paradigm of difference since the time of colonial encounters. What constitutes the architecture of the modern world system and informs its shifting international orders? How can an interpretation of the essence of modernity and empire from the African perspective contribute to the expansion of frontiers of knowledge in the field of world history? How did Europe manage to usurp world history? What has been the impact of European usurpation of world history on Africa in particular and the Global South in general? These questions led me to a long search for an innovative theoretical framework to use to effectively unmask the political constitution of the modern world systems and its international orders; to engage critically with negative effects and impact of modernity, imperiality, and coloniality on the world; and to dig deeper and try and recover displaced archives, marginalised thinkers from Africa and the Global South, ignored concepts and suppressed knowledges. My concern has been with theory and methodology as well as locus of enunciation. I landed on Immanuel Wallerstein’s world systems analysis at the Latin American Modernity/Coloniality Research Programme; From radical Latin America scholars, I learned of decolonial analysis or decoloniality. Theoretically and conceptually, therefore, my research work is underpinned by a combination of world systems analysis and decolonial analysis. At the centre of this theoretical-conceptual framework are three concepts: First is power, useful in the analysis of the political constitution of the modern world system and its orders; second is knowledge, which enables delving deeper into epistemological issues underpinning the modern world; and last is being, which enables critical enquiry into ontological questions, subject formation and subjectivity. Deploying this theoretical-conceptual toolkit, I arrived at the conclusion that coloniality is the fundamental problem operating at the centre of modernity and that decolonization needs to be pushed forward if such peripheral epistemic sites like Africa have to be genuinely liberated from the imperial-modernist-colonial power structure in place since 1492. What came into being in 1492 was well described by Ramon Grosfoguel as a new racially hierarchized, patriarchal, Euro- and North American-centric, Christian-centric, hetero-normative, capitalist, colonial, modern world system. At its centre was modernity as its driving force. It unfolded in terms of colonization of time, space, being, knowledge and nature: It gave birth to Eurocentrism. Eurocentrism is a relatively modern construct but its impact on the world is overwhelming. Eurocentrism — while not a coherent ideology — can be articulated as a constellation of European prejudices and bundle of myths of white superiority; a sum of ‘white ignorance’ masquerading as knowledge and mistrust of ‘Others’; Óracial chauvinism; and xenophobia. Samir Amin, one of the world’s foremost political economists described Eurocentrism as one of the greatest forms of ideological deformations. Eurocentrism assumed the status of a Euro-North American theory of human history which privileges the Greek-Roman classical world as the cradle of human civilization in the process overshadowing the reality of Africa as the certified cradle of human kind. Eurocentrism could not have emerged without Europe successfully usurping world history, which involved Europe positioning itself as the centre of the world from which the world is described, conceptualised, imagined and humanity defined and ranked. This hijacking of world history, entailed re-articulation of the whole story of humanity in a Eurocentric historiographical narrative as progressing from Greek-Roman centres, to the rise of Christian-feudal Europe, to European capitalism, right up to the current triumphalism of the U.S. as the sole world superpower—as the telos of human progress. Paul Tiyambe Zeleza termed this narrative the Athens-to-Washington discourse of world history. Within this usurped world history, Africans emerged as creatures of what Valentin Y. Mudimbe termed the paradigm of difference informed by a modernist discourse of alterity sustaining what Frantz Fanon termed the European game. The idea and invention of Africa became articulated in terms of disability, lacking and deficits. Within the Athens-to-Washington discourse, African being and subjectivity is perpetually imprisoned into what Nelson Maldonado-Torres termed the racist-imperial Manichean skepticism as a form of denial of humanity of black people. No wonder why articulations of African being and subjectivity has commenced in this fashion of a people without souls, a people without religion, a people without history, a people without civilization, a people without development, a people without democracy, a people without human rights, and people without ethics — a corrupt people. The list is endless. The result of this was gradual and accumulative loss of ontological density by black people. I must conclude by saying the deployment of racist-imperial Manichean skepticism had a practical purpose and impact on African people. It meant closing them out of what Lewis R. Gordon termed the ‘zone of being.’ They have since 1492 being pushed into the ‘zone of non-being.’ It also meant that African people could be treated like commodities or things available for enslavement and colonization. Since then the African struggles have been for regaining lost ontological density. This is a story that is detailed in Empire, Global Coloniality and African Subjectivity.